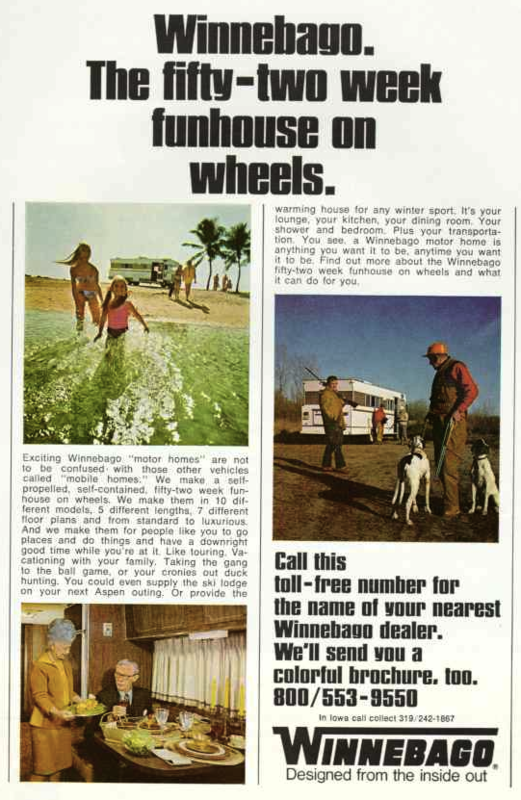 I love this old advertisement for Winnebago that I found in the April 1970 issue of National Geographic. Exciting Winnebago “motor homes” are not to be confused with those other vehicles called “mobile homes.” We make a self-propelled, self-contained, fifty-two week funhouse on wheels. We make them in 10 different models, 5 different lengths, 7 different floor plans and from standard to luxurious. And we make them for people like you to go places and do things and have a downright good time while you’re at it. Like touring. Vacationing with your family. Taking the gang to the ball game, or your cronies out duck hunting. You could even supply the ski lodge on your next Aspen outing. Or provide the warming house for any winter sport. It’s your lounge, your kitchen, your dining room. Your shower and bedroom. Plus your transportation. You see, a Winnebago motor home is anything you want it to be anytime you want it to be. Find out more about the Winnebago fifty-two week funhouse on wheels and what it can do for you. I love how they tell you all the things you can do with a camper. They didn’t even get the full list. Taking a large group of people to an event. Tailgating at a sporting event. Staying in locations where there aren’t any hotels. Guest room for when your house is overflowing with guests. Sure, that’s what I get from my camper when it is being used, but I also get so much more from it. A project to make my own. A blank canvas to work with. Something the family can work on together. All of these aspects of owning a camper only come when you buy a piece of junk and make it awesome. That feeling of finally camping in a camper that you have worked so hard to make great is beyond anything that I could ever get from buying a brand new camper. I think that’s why I’m always on the lookout for a new project.